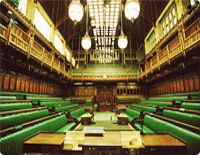 An Early Day Motion (EDM), in the Westminster system, is a motion, expressed as a single sentence, tabled by Members of Parliament for debate "on an early day" (namely an unspecific date in the future). Controversial EDMs won't be signed by Government Ministers, PPS or the Speaker of the House of Commons and very few are debated on the floor of the Chamber of the House. EDMs remain open for signature for the duration of the parliamentary session. EDMs are used for reasons such as publicising the views of individual MPs, drawing attention to specific events or campaigns, and demonstrating the extent of parliamentary support for a particular cause or point of view. > EDMs against statutory instruments (are known as 'prayer') - generally the only type of EDM that leads to a debate. > Internal party groups - put forward by party members to express a different view on an issue to the official party position. > All-party EDMs - usually promote an issue, such as animal welfare, across party divides. Generally, only all-party EDMs attract a large number of signatures. > Critical - occasionally EDMs are tabled criticising another Member of the House, or a member of the House of Lords. > Promotion - of an outside campaign or report (often by the voluntary sector). > Constituency issue - drawing attention to and commenting on. > Commenting on deficiencies in other parties' policies - often by government MPs as they can't criticise the Opposition at question time. Is John Cryer Backing Your Campaign? If you are interested in a particular issue or a campaign, and you want to know if John Cryer has signed the Early Day Motion or EDM, you can check by clicking on the link below.